Pharma 3 Tren 200 mg is manufactured by PharmaCom Labs from Moldova. The active ingredient of the drug is the mixture of esters of trenbolone. 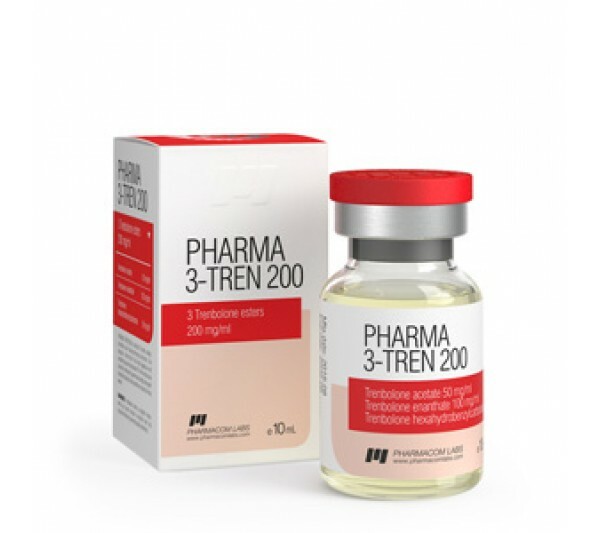 Pharma 3 Tren has a concentration of 200 mg / ml and is an injectable solution. This tool is a strong anabolic and androgenic steroid based on trenbolone ester mix. The mixture contains acetate, hexahydrobenzyl carbonate and enanthate. It contributes to the long flow of the active ingredient into the bloodstream and synergistic effect. Course application is carried out without a recession, the main component remains active for about 2 weeks. Trenbolone has a chemical structure: 19-nor derivative of testosterone. Anabolic activity is 500%, androgen activity is 400%. On the control of doping, the drug can be detected within 5 months. This tool is better to use only experienced athletes. The injection should be made 1 time in 7 days, the average dose is from 300 to 4000 milligrams. To ensure the required volume of the drug in the body, increase the number of injections to 2 in 7 days. To prevent the suppression of the production of your testosterone, gonadoprine is used. Clomidili Toremifen is used as a post-course therapy. Pharma 3 Tren 200 is also combined with Sustanon (500 milligrams each in 7 days), and at the end of the course taking, use stanozolone tablets or testosterone propionate. Proviron reduces side effects to a minimum.